Modern, sleek, and effortless. All words our brides use to describe the epitome of their wedding day style, and everything we attempted to emulate in our latest bridal stylebook. Between our bridal designers adapting their wedding gowns to more chic and elegant bridal looks, to couples creating custom one of kind wedding ceremony decor, today’s wedding incorporates more industrial inspired vibes than ever before. 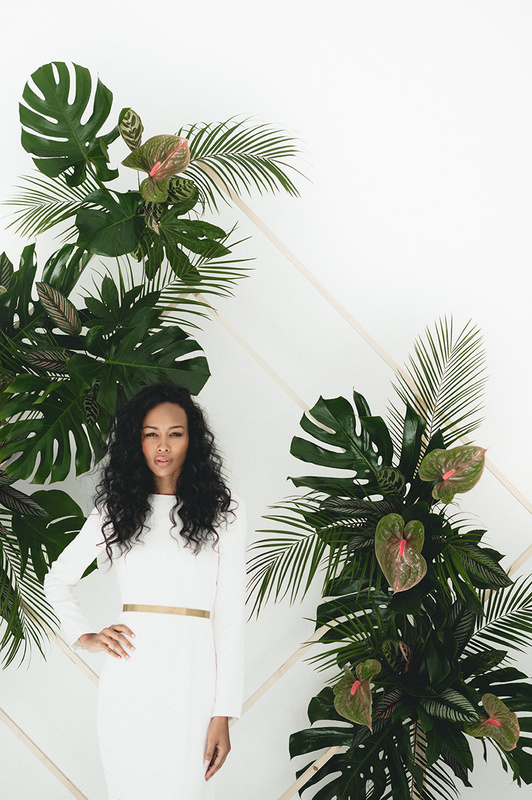 We searched for a space in the Deep Ellum neighborhood of Dallas, TX to serve as the canvas for this bridal lookbook. The white brick walls, lofted ceilings, and huge windows provided the perfect blank page on which to showcase our custom made installations, and most importantly, our killer wedding gowns. When selecting the looks for this styled shoot, we knew we had to have the latest, most jaw dropping wedding gowns from our recent trip to the October Bridal Market in New York City. Alexandra Grecco is one of our most classic, yet fashion-forward bridal gown designers. The clean lines of the “Gemma” gown paired with a sleek gold belt from Lia Terni is one of our favorite looks from this shoot. 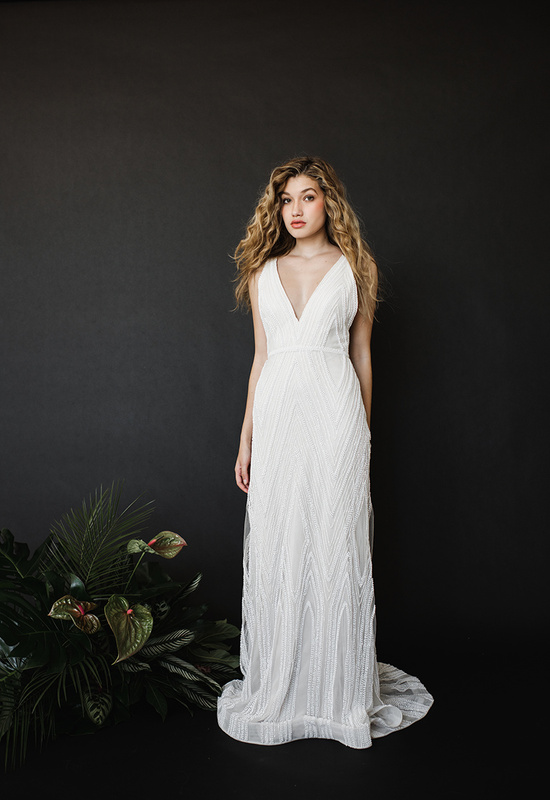 Grecco’s Chiffon “Annika” wedding dress cape paired over her “Astrid” slip fitted wedding dress is reminiscent of Carolyn Bessette, while the cape could not be more on trend. Brides are ditching the classic wedding veil for this avant garde bridal accessory. Sleek crepe styles aren’t the only way to emulate today’s trendy look. The “Galatea” wedding gown by Willowby was a star at the shoot. This unconventional ballgown styled wedding dress features a silvery grey hue and graphic oversized lace appliques hand sewn throughout the skirt. The plunging v neck is a flattering neckline for all body types, while the banding around the natural waist highlights a very feminine feature. Wedding dress designers such as Truvelle and Anais Anette chose to incorporate matte texture to their simple gowns. Three dimensional flowers adorn the “Collette” wedding dress bodice by Anais Anette, while the “Kim” wedding dress from Truvelle’s most recent collection boasts matte white beading atop the lace bodice. Jane Hill’s “Dolce” bridal gown is designed with geometric pearlescent beading throughout the entire bridal gown. Styled with effortless wild hair, and glowing natural makeup, these refined styles remain young, fresh, and easy going. While creating the inspiration for the shoot, we decided statement accessories were crucial in executing our bridal looks. Mother of pearl and brass accessories by designers A.B. Ellie and Lia Terni were showcased along with our wedding gowns. Statement earrings and structured belts are replacing flower crown and sashes. Natural elements like quartz and brass are preferred to the rhinestones of past trends. A huge thank you to our fellow collaborators who made our inspiration come to life through decor, florals, hair and makeup, and installations.